, we made it easy for you to see your friends’ ratings and reviews listed right inside search results. While this is really helpful, and we’ve had a lot of fun with it, we often found ourselves wanting to see all recommendations by a particular friend for a particular search. Problem solved, thanks to a simple new feature we cooked up. 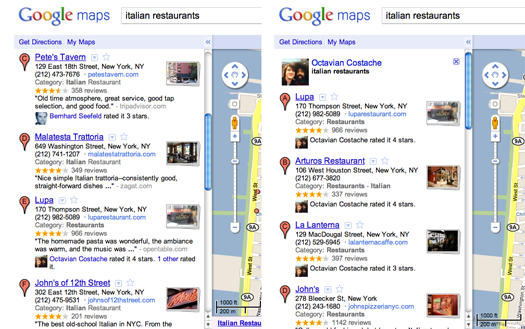 Say I’m searching on Google Maps for “italian restaurants” in New York. I’d probably trust my buddy Octavian’s recommendations over Bernhard’s (who is more of a hamburger guy, really). 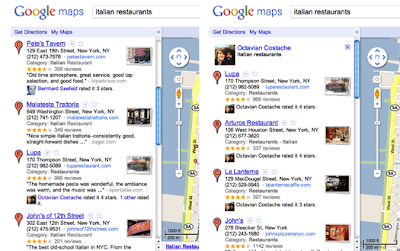 Now all I have to do, to see Octavian’s entire list of Italian restaurant recommendations in the city, is click on his name when he pops up in my initial search; this filters my search results to only those he’s rated and shows them on the map. It’s like I’m seeing the world, through Octavian’s eyes. Getting a hand from a friend is even more helpful when I’m on the go. So now I can do the same thing in Google Maps for mobile on Android; clicking on Octavian’s name in my search results filters to show only his recommendations. Add your friends (at least those with good taste) on Hotpot and encourage them to rate so you can explore their recommendations when you search on Google Maps. Most of us know lots of friends, each with very different areas of expertise when it comes to places to recommend. With the recent launch of Hotpot, we made it easy for you to see your friends’ ratings and reviews listed right inside search results.